We are getting closer and closer to race day. 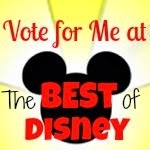 Now, it’s time for some of the final considerations when running Disney. 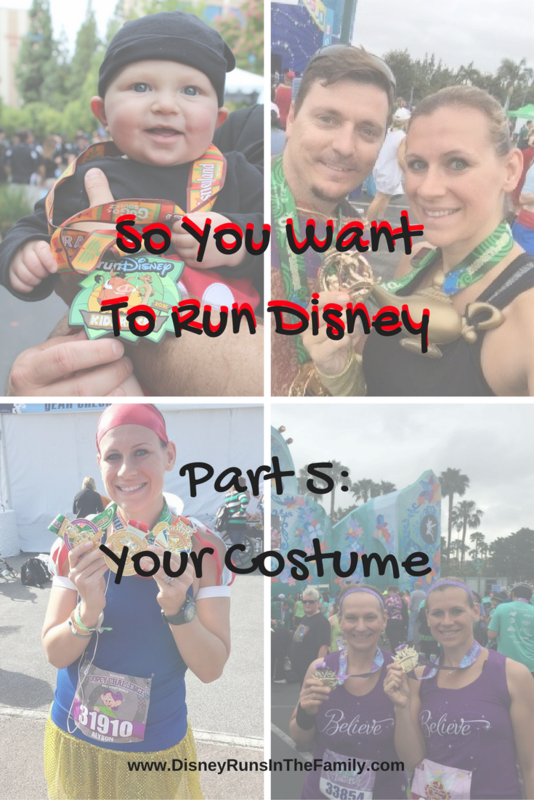 This post might not be for everyone, but many (if not most) people wear costumes to a runDisney race. I always have, and I have never regretted it! I even can get my family to wear costumes, and sometimes we theme it out together. You will want to start planning your costumes at least a month in advance (or if you’re like me, you’ve got the next year planned and then sometimes end up executing the morning of...yes, true story!). You can get many accessories for race day at the expo, but I try to be 100% sure I have everything before I arrive. You never know if they will run out of a size or not have the right color. I have done it, so it’s most definitely not impossible, but if you’re a worry-wart like me, it’s best to plan ahead. If you are really planned, you can purchase your next “set” of costume accessories at a previous race’s expo! Also, check your favorite retailers (like some I give a shout out to below). More and more they are allowing you to pre-purchase products and choose 'expo pickup' to save on shipping. Then there is no guess-work or risk! My costume planning always starts with a trip to Google Images to get inspiration. I often will use the theme of the race to inspire me as well. I know, I know, it’s not the most creative, but hey, I like it, so who cares! There really are no rules. If you want to be unique, veer away from the theme. Mickey and Minnie are always popular. And yes, I do recycle costumes. I have a few rules of thumb: First, my “base” of the costume is ALWAYS running gear! I have my favorites, but that is for another post. This has worked for me, especially in terms of comfort and reliability. I will purchase specific colors to work with my costumes, but I stick with tried and true brands and styles. Second, I scour the sales at craft stores to try and get the best price. You can make a tutu EASILY, and if you have any sewing skills, costumes can be a breeze. I have little, but have managed to make many costumes without touching a sewing machine. Third, shop the clearance costumes after Halloween, if it fits in your schedule. Yes, I have flat out purchased costumes too. This is also great for some simple accessories. Fourth, make it cheap—which is an extension of 2 & 3. Why? Yes, I would rather spend money on other things, but more importantly, if a costume piece isn’t working, I want to feel no guilt in tossing it in the trash if it starts to annoy me. Finally, I base the complexity of the costume off what my goals are and the distance of the race. My Figment tail would have driven me NUTS over 26.2 miles, but it was fine for the 5k. A few more thoughts: Try it out before race day. I will admit, I don’t do this for every piece, but for anything touching your body/skin, you have to give it a trial run. This is why I suggest at least a month lead time. I learned this the hard way at the WDW Marathon. I waited too long to purchase my shirts and ended up with chaffing that was KILLER. It took months to heal (I started to think I would always have this permanent reminder of the Dopey Challenge and my poor planning). Yes, I tried it for a few miles, but after getting sweaty over close to 5 hours, my 4 mile trial was useless. Head gear is another thing you have to be willing to try, especially if you spent good money on it. I will not compromise my favorite shoes to match a costume. Some people will, but my shoes are the most important part. I will, though, get socks to match my costume. Always pack your costume in your carry-on. I’ll get into this more during the packing post, but it’s so important, I’ll tell you twice! And last but not least—HAVE FUN! Don’t be shy. 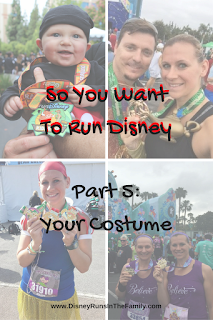 No one will judge you for wearing a costume, especially at a runDisney event. It doesn’t have to be the most extensive costume ever, even just a sparkly skirt and some ears will do. Not the best pic, but LOVED the costume!